The is the third book in the Force series, the other two being Force: Dynamic Life Drawing for Animators and Force: Character Design from Life Drawing. The two earlier books were on drawing humans. 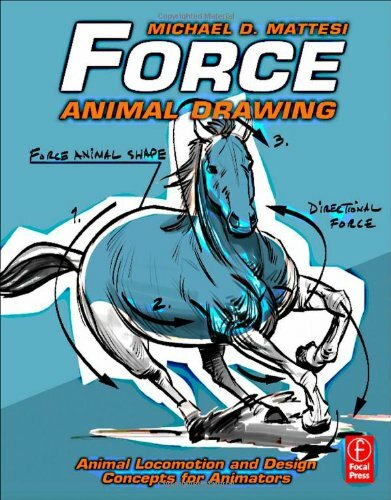 In this book, the similar concept of understanding and using force is used, this time for the goal of making animal drawings lively and natural. The book is theory based. It aims to give readers a broader understanding of how force works in animals. With some simple rules, the knowledge can be transferred to drawing other animals. The animals covered are arranged based on their speed, Plantigrades (slow land animals), Digitigrades (intermediate-speed land animals) and unguligrades (fast land animals). Only mammals are covered. There are bears, raccoons, kangaroos, dogs, cats (big ones also), elephants, horses, deers and many more. The section on birds is just a few pages. Mike Mattesi's examples featured are great, you can feel the energy of animals just by looking at their poses and gestures. I would actually recommend getting the first Force book as well to understand the concept of force better. This is a great book for artists who love drawing animals. I have both this book and the first "Force" book. I would say the first Force book is better: it explains the concept of force better, and it covers human figure drawing plus animal and on location drawing. The animal drawing book repeated a lot of the information from the previous book, and I personally didn't get a lot out of it. It's not a bad book, but the first in the series is better. I don't have this book but from what I see it is sh*t.
"The art of Animal Drawing" is twice even three times cheaper than this book and have literally thousands of drawings in it. Way better investment for art lovers and artists - beginners and professionals. If you have not made a review of it please do. Ken Hultgren was the author. Ken Hultgren was the author. Sorry that I missed it.